It has only been 4 years since she took her first steps in Limerick but it is still the most remembered weekend of the City of Culture 2014. It would be great to have the Royal de Luxe team back. Cheers again to Zeb Moore on giving his time back then for this short doc. Colin Craker (3rd year Creative Broadcast and Film Production Student) receiving the #richardharrisinternationalfilmfestival award for film excellence. 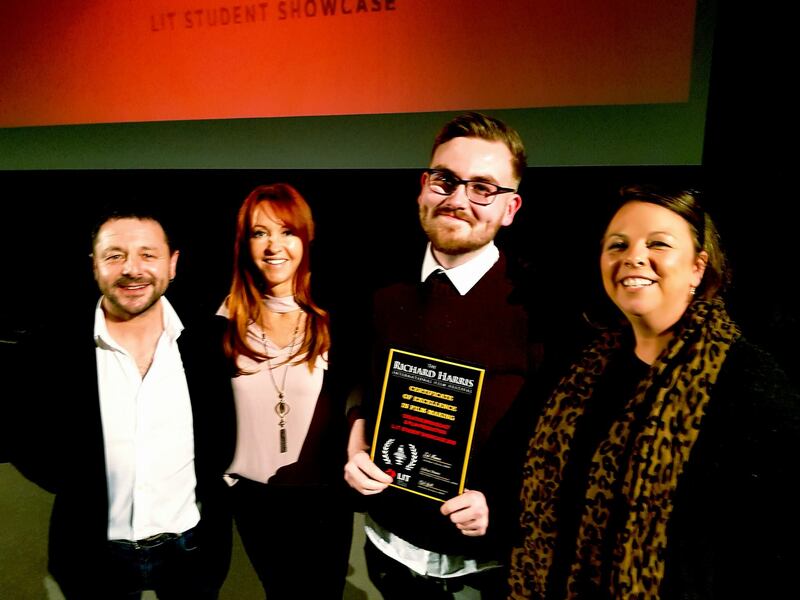 Big congratulations to 3rd Year Creative Broadcast and Film Production student, Colin Craker, for winning the inaugural ‘Richard Harris International Film Festival Award for Film Excellence’, at the Frame By Frame Student Showcase on April 12th. 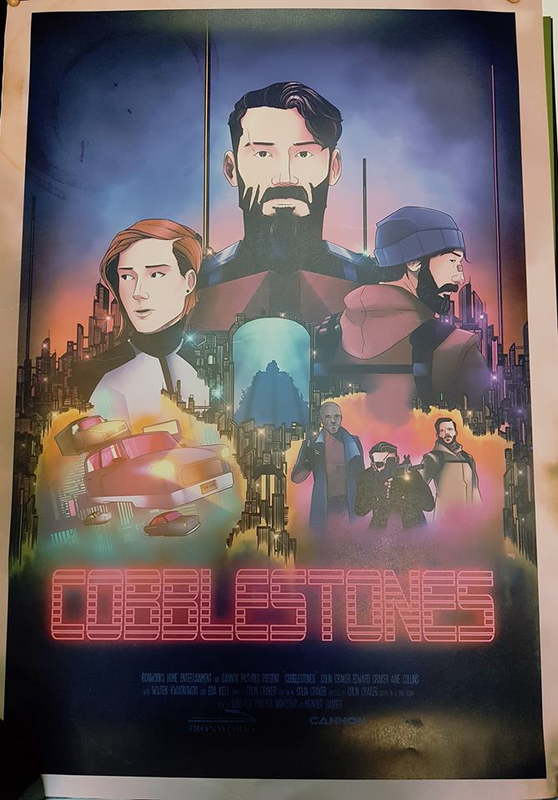 His short animation, titled ‘Cobblestones‘, had the audience spellbound with ‘Bladerunner’ visual influences and all produced using Adobe Photoshop and After Effects, which impressed the RHIFF team of Zeb and Sylvia Moore. The Frame By Frame Student Showcase, was created and run by the Students and Staff of the Creative Broadcast and Film Production Programme at Limerick Institute of Technology and will return again in 2019 where new talent and display their work to their peers and industry professionals. It is expected that Colin’s film along with the other productions will be entered into the Richard Harris Film Festival and will screen in October this year. 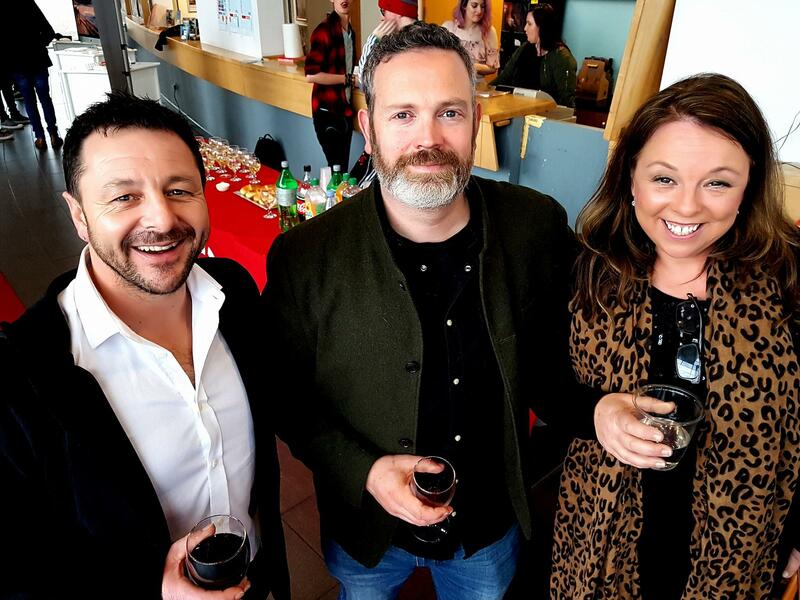 Zeb Moore (RHIFF), Simon McGuire (Post Production Lecturer) & Sylvia Moore (RHIFF) at the opening reception of the Showcase. The Management Team and Board of The Richard Harris International Film Festival will now run the Limerick Film Festival, with Simon McGuire also joining the board. Simon McGuire, LFF, & Zeb Moore, RHIFF. The legacy of both festivals will be kept alive as the newly-partnered entity continues to nurture talent in the Mid-West and beyond. “Over the past eight years the Limerick Film Festival has strived to work with professional broadcast and film craftsmen and women to bring together a festival that would be both unique and attractive to third level students and filmmakers alike. The new merger with the Richard Harris International Film Festival will strengthen those industry connections while also bringing together the best elements of both festivals in one series of events. 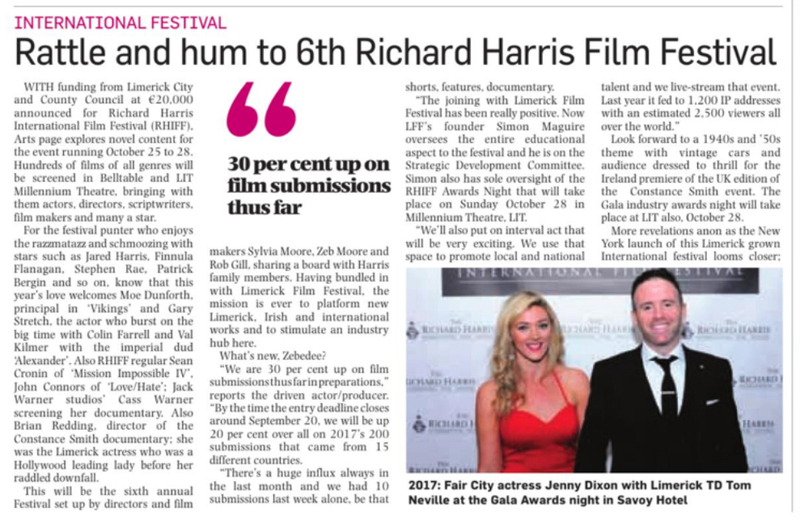 “As a long-time supporter of LFF I am delighted with merger of the two main film festivals in Limerick, as a direct result of the merger a new category for students has been added to the RHIFF festival submissions process. We at RHIFF are thrilled to now include a specific student category showcasing the enormous talent of the film-making future to Irish and International audiences. Following on, from what was an incredible weekend to be remembered, here is the short documentary ‘One Giant Leap’ featuring local Limerick actor; Zeb Moore, retelling the story of his experience working with ‘Granny’ and the Royal DeLuxe in Limerick (Sept 2014). Shot over the three days on location in Limerick City. Special thanks to Zeb Moore, for his generous time to talk in this piece, as well as the team in Limerick City of Culture 2014 including: Sheila Deegan, Olivia O’Sullivan, Lavinia Duggan and Mike Fitzpatrick. All the music is by Michel Augier, Royal DeLuxe La Bande Originale! Production Took place on location in Limerick this week of a short trailer for ‘The Outlaw Concy Ryan’. This will be entered into the RTE Storyland Competition in the coming weeks. Post Production is taking place as I write this and it should be locked and read for delivery in the coming days. Directed by Ivan McMahon (Two Hungry Fish Productions) and Produced by AppleBox Media, this trailer sees the ‘Limerick Uncovered’ Internet star Concy Ryan, making his reappearance to the TFT screen. Below are some pics of the shoot. Shooting continues again today on the short, ‘Scumbag Millionaire’ starring Francis Ryan, Zeb Moore and Nigel Mercier. The story tells of Danny, a criminal gang member, who is trying to move up the ladder only to find his own gang turning on him. With the sudden win of the Lotto, his gang become interested in him again however a rival gang have also got plans for Danny and what he holds dear to him.